Check Writer III+ is an easy to use program that lets you write and print checks directly from your desk, together with their accompanying letter. 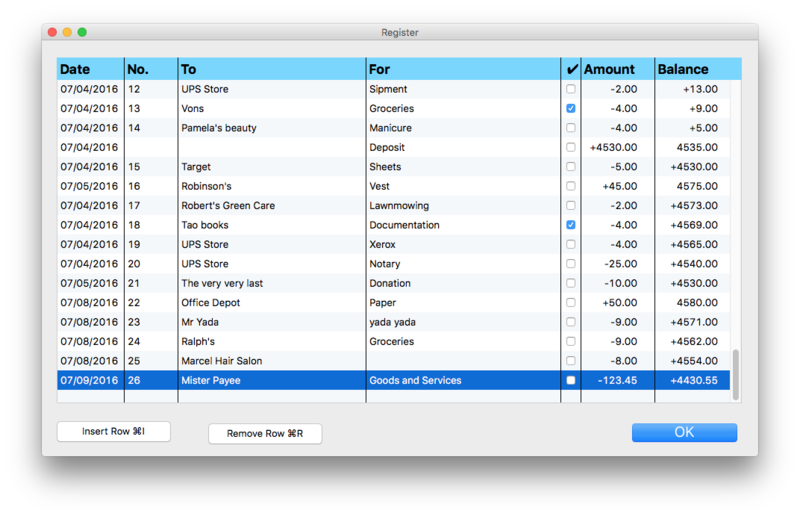 Simply enter the name of the payee (made order to), the numeric amount, and voila! The spelled out amount is automatically generated. No need to write out complicated sentences. The check is printed with at the bottom special MICR characters which will be used by banks for processing. So now your printed check can be used the same way as a pre-printed check. Transactions are recorded the same way you would with a physical checkbook, in a registry which keeps a record of all checks, and calculate your balance automatically. Like a real records booklet, you will also be ale to enter deposits and other transactions from your statement, such as direct deposits, ATM withdrawal, debit cards and other items, to keep current. You will also be able to reconcile transactions with your statements, to constantly have at hand your current balance. Under the check is a word processor to print the accompanying letter together with the check. It works in all the single checks types of paper. With one check on top or one check in the middle, the letter will be printer below. With one check at the bottom, the letter is printed above, on top of the sheet. With Personal size, the text is always printed at the bottom of the sheet, in the area left blank on pre-printed forms such as VersaCheck 3001. The most interesting feature of the Letter area is the use of variables that correspond to the content of the check. As you can see on the screen shot above, the letter uses hashtag coded words that will automatically pick the values of the check. Any check can be displayed again, to view or print. Print as many blank checks as you want, to use them later like you would normal bank checks. Click on the check type icon last in the middle that says "Standard". The check will become Personal, wallet-size (VersaCheck 3001). Banks often adorn their checks with background pictures. You can do the same with one of the twelve specially prepared pictures that come with Check Writer III. 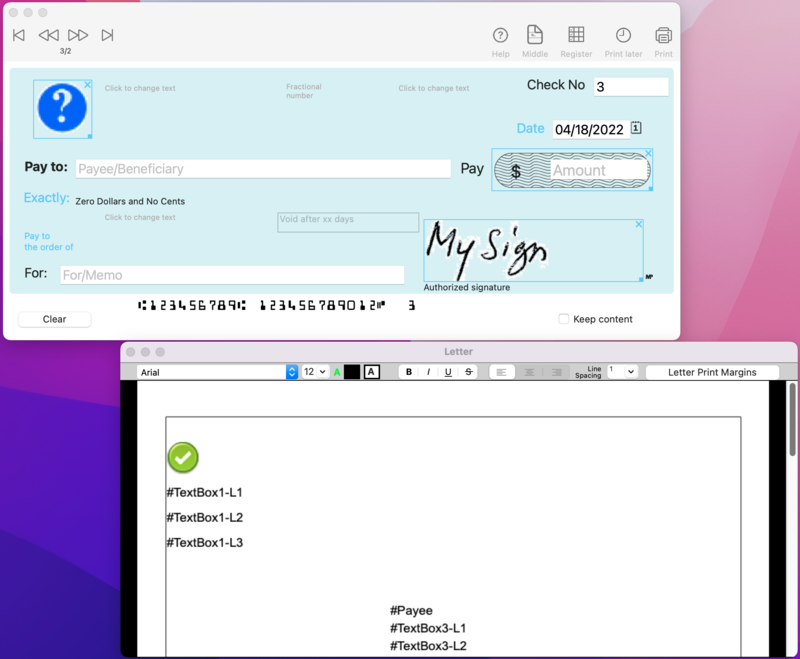 You can easily have Check Writer III sign your checks automatically. Drag and drop the file over the signature area, in the lower right side of the main screen. It will automatically be sized to fit. You can add up to 9 pictures to each check. Every element of the check can be moved just the same way as the picture box. You can also change the font for mentions, would that be "Pay to", the spelled out amount, or "For". Right click and select "Change font". 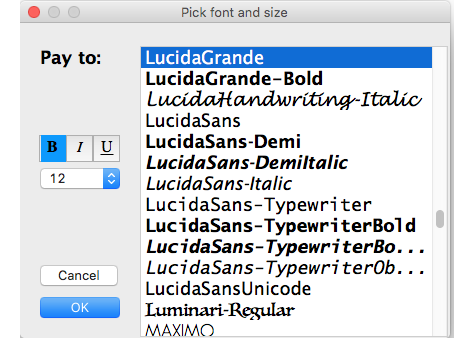 A window appears (see right) when you can select any font. If you use pre-printed checks that already have mentions such as "Pay to" of "$", you can suppress their printing. Right click on the element and select "Do not print". The element will turn blue and will not be printed. Notice "Exactly" and "Date" appear light green as they are used only for printing blank checks. But you can suppress their printing as well if your check stock has these elements already printed. You can very precisely set top and left margin, as well as the height of checks, to accommodate different kind of pre-printed forms. Every time you write a new check, the transaction is recorded in the Register, where just like a paper records booklet, everything is written. Your balance is also calculated automatically. The first time you run the program, it contains only one line : Beginning balance. Use your last statement or online access to set that value in the Balance column. Afterwards, the program will use that value as reference to calculate the new balance. Use the register exactly as you would a records book. Columns are marked the same way, and rows are easy to follow, thanks to the color background lines. You can manage up to 15 different accounts and switch instantly. Checks can be printed on ordinary paper, but also on any standard VersaCheck 3000 or commercial size check refills. Such paper stock can be found at fine office supply store such as Office Depot or Stapplers in three per page, or voucher format (easier to use), where the check is at top, middle or bottom position. Pre-printed check stock usually comes with special security features such as anti-copy, anti-scan and even holographic protection. Check Writer III also supports Personal Wallet size paper. Checks will be printed smaller, and on the right hand side. A stub is printed on the left hand side of each check. As default, Check Writer III supports VersaCheck #1000, 1001,1002, 3000, and Personal Wallet Size #3001, but all forms can be used. download instructions are sent when it does. 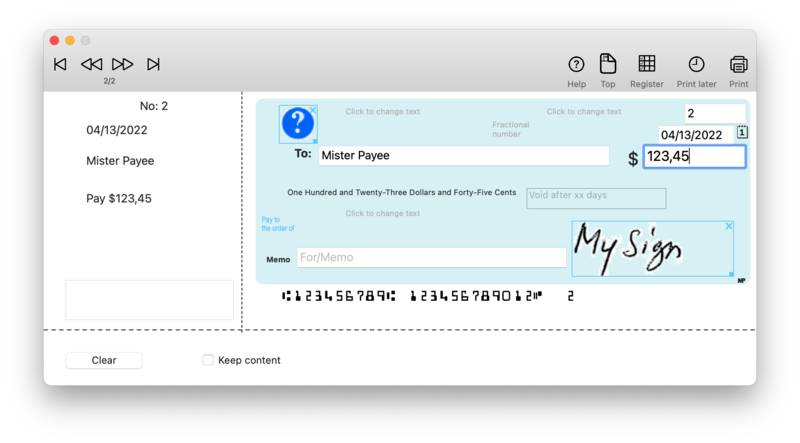 Check Print'R+ is an easy to use program that lets you write and print checks directly from your desk. Simply enter the name of the payee (made order to), the numeric amount, and voila! The spelled out amount is automatically generated. No need to write out complicated sentences. Transactions are recorded the same way you would with a physical checkbook, in a registry which keeps a record of all checks, and calculate your balance automatically. Like a real records booklet, you will also be able to enter deposits and other transactions from your statement, such as direct deposits, ATM withdrawal, debit cards and other items, to keep current. You will also be able to reconcile transactions with your statements, to constantly have at hand your current balance. Check Print'R also supports Personal Wallet size paper. Checks will be printed smaller, and on the right hand side. A stub is printed on the left hand side of each check. Cut checks can be printed by attaching the check with double sided Scotch tape to the upper right corner or a blank Letter size paper sheet. They can also be printed sideways when introduced between guides where the stack of blank paper usually takes place. As default, Check Print'R supports VersaCheck #1000, 1001,1002, 3000, and Personal Wallet Size #3001, but all forms can be used. 2 - Immediately after you are finished paying, Paypal will confirm the transaction on screen, and an email will be sent to you with your license key. 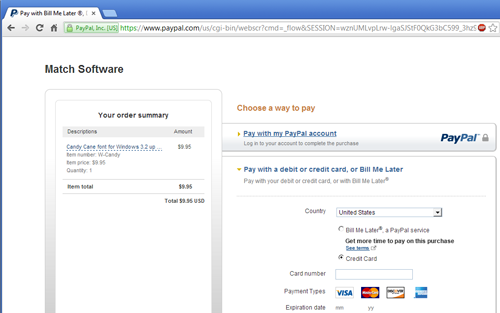 Payments by eCheck take 3-5 days to clear, license is sent when it does. IMPORTANT : If you do not see this mail in the next few minutes, look into the Spam or Bulk folder. Very often mail filters on GMail, Hotmail, Cox, Yahoo or AOL misplace automated mail. Unfortunately, we have no way to find out. 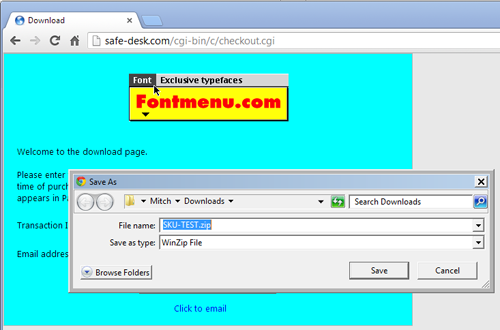 Programs are delivered in a zip archive. Double click to open, then extract the familiar dmg virtual disk in which you find the app to drag to the Applications folder. Disclaimer : Check Writer III™, Check Print'R™, are trademarks of Match Software and its owners.